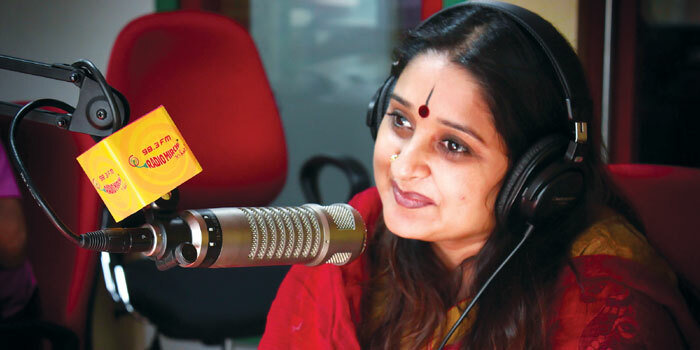 With over 40 films and TV shows to her credit, Bangalore-based actor Malavika Avinash dons the role of an RJ for the latest show in town a�� Lifeu Ishtene on Radio Mirchi. a�?It is about inspiring stories of real life heroes narrated in their own words and trying to find an extraordinary story in an ordinary mana��s life,a�? station head, Rashmi R tells us. The series is set to be a host of narrations by Avinash, which will relay stories from chaiwalla to chief minister, in what promises to drive Bangaloreans to achieve the impossible, inspired by real life heroes. a�?This is a fantastic initiative to motivate people. I see this as a great opportunity for me as well as the listeners to meet real life heroes and listen to their inspiring stories,a�? begins Avinash, adding that it is the first time being on air for her. a�?That said, I am up for the challenge and hosting the show has made me extremely happy and at ease,a�? she says, and that is what Rashmi will be hoping city dwellers too feel. a�?For that wea��re counting on Malavikaa��s fruity voice to bring in the freshness and captivate the listeners,a�? Rashmi smiles, elaborating that the RJ/actora��s strong opinions and exposure to various fields, made her the ideal choice to host the show. A continuing initiative which will see stories being crowd sourced, is set to be on air until a�?all Bangalorean listeners are inspireda��, and their aim is to bring in smiles, hope and positivity after a hard day at work. a�?It is not just about sharing views on love or just music, wea��re hoping to engage the listeners with content to motivate them,a�? she signs off.